Leader for Floating Platforms for every models of Jet ski and Floating Hauling Sytems for small boat until 10 meters lenght. Rotoport is our floating jet ski dock. Ready to use, tried and tested for over 10 years. New port for every models of jet ski. 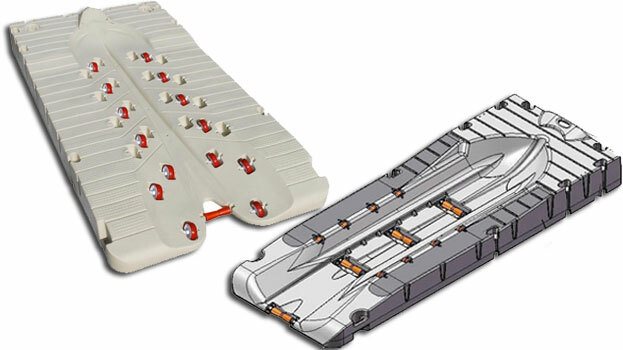 200x400 cm With adjustable rollers for every jet ski's hull. Modular floating boat lift system platform hauling rafts and small boats until 10 m.
The floating systems for jet ski Rotoport and Jetport and also the "boat lift system" for hauling boats are modular, expandable, and can be joined each other. Stable. secure, ready for use. Made by high density polyethylene, with central and side rollers in teflon and steel, all our floating hauling systems are guaranteed 5 years. Jet ski docks for every kind and brand of watercrafts. Hauling floating modular system for tender and boats.